Clouds Clouds Clouds. With a weightiness the color of amethyst. Light on the horizon. A sun. No point, no pane, no space, no rainbow. A stripe. A circular course. A bee loop. Honey-colored amber. Words. Our glistening white glider jumps through with ease. Capers. Barrel rolls. Heartbeat. A rain of petals, a crystalline scraping, a crackling submersion. A washed-out font, aquamarine words, blurred. An ongoing-life. Streaked paper stripes fluttering in the mild spring sky, lucid brushstrokes form a language, a dream, a consolation, a lullaby: Guliagava - Guli…? A matter of the heart. 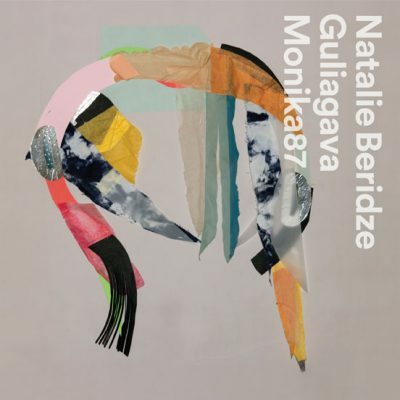 Guliagava, by Natalie Beridze, TBA, Tusia Beridze. Like her previous albums, it was recorded in Tbilisi, south-easternmost Europe. The Georgian metropolis is far from pop-cultural arteries, nevertheless its youth observes precisely what is happening outside, and installs that otherness in their own world with a delicate hand. Yet they never run the risk of piddly writing a diary, on the contrary, they again make this now expanded own, this enriched own available for the outside world. Natalie Beridze's cooperation with Monika Enterprise began in 2005 – she was one of four artists on the compilation 4 Women No Cry Vol.1. Her album Forgetfulness followed in 2010. Over the last two years Beridze produced Guliagava. Three pieces – "Museum On Your Back", "Those Things", "Opening Night" – were created with Gacha Bakradze (Apollo/R&S), with whom Beridze has collaborated since 2014. "Opening Night" is also part of the soundtrack to the award-winning film "When the Earth Seems to Be Light" by Salome Machaidze / David Meskhi / Tamuna Karumidze. The song "Hello" Beridze wrote with Gio Koridze, a student at Tbilisi's media university CES, where she teaches composition. The words to "Fishermen 2015" come from the farewell letter of a Syrian refugee who drowned in the Mediterranean. Guliagava is a fantasy word that Natalie Beridze's little daughter Lea once seemed to hear in a Russian lullaby. She speaks the word Guliagava when she needs comfort, when she needs a hand to cling to. Natalie Beridze's music is of a rare, bewitching beauty – even when her beats are shredded or when she rocks with an abrasive four-to-the-floor. She moves within her own characteristic tonality of diminished chords that frequently extends into the minor harmony – a tonality within which an unsettling, questioning undertone often resonates alongside the sense of melancholic longing. Beridze rises to the highest of spheres on Guliagava. While in her older releases lines could be drawn to IDM and Broken Beats or Detroit Techno, and an admiration for musicians such as Autechre, Aphex Twin or the Cocteau Twins could be detected, here there is a suggestion of R&B over Dubstep. But its a kind R&B over Dubstep based on the bold assumption that both styles clearly trace their lineage to Kate Bush. Of course, that's not to suggest that Natalie has any need to imitate. She is well-versed and looks back on 15 years of musical production, including several film scores, on the setting of poems (Tsvetajeva, Brodski, Breton, …), on collaborations with Ryuichi Sakamoto, Antye Greie/AGF, John Beltran, or Thomas Brinkmann. Where previously it was often enough for Natalie Beridze to suggest, to persevere, to imply the breaks, here she formulates. Her vocals have never been so animated, her songwriting has never sounded so complete, and her arrangements, for all their complexity, have never been so round. Guliagava is Beridze's tenth album and it is nothing less than her masterpiece.